The rings in the photos are sold, and are shown as an example of these ring sets. 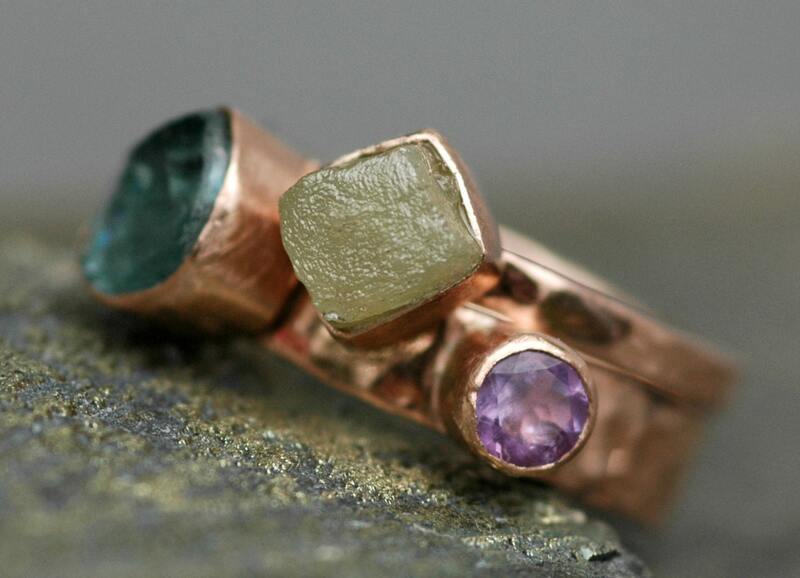 These two rings began as custom-milled strips of 14k rose gold. The thinner band is made from 2mm ring stock, and while the wider is 4mm. The width was slightly enlarged by hammering. I gave both bands a hammered and polished finish, including their edges. The interiors are polished to a high shine. The photos with the brighter background were taken in bright sunlight, while those with the gray backgrounds were taken in a lower, natural light. 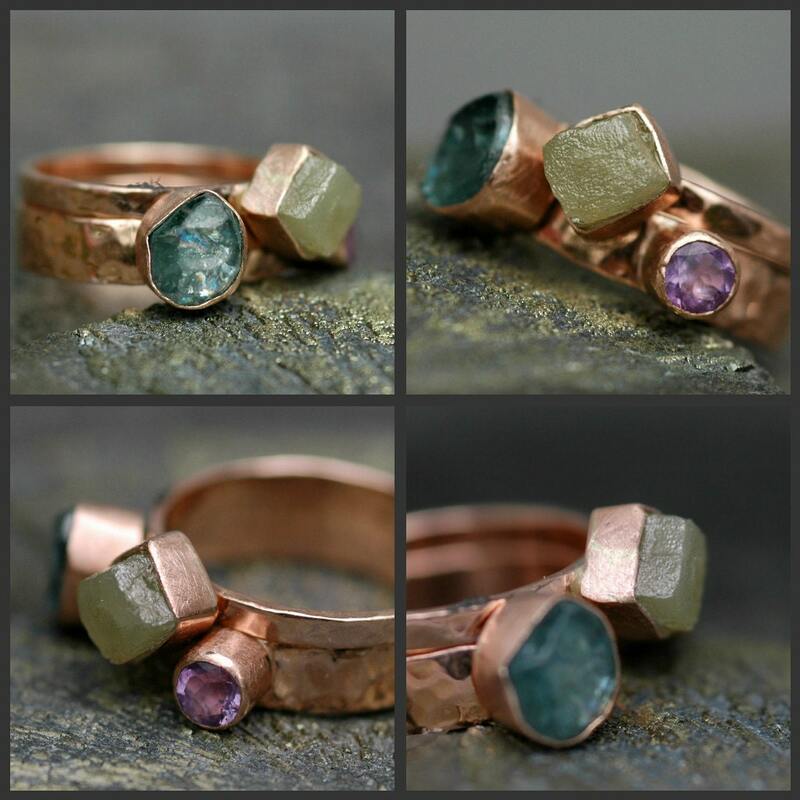 I have chosen to show these rings in a variety of lighting conditions to give you and idea of how the varying intensity and types of light can affect the appearance of the metal and the stones. The engagement ring showcases a conflict-free, naturally-formed diamond cube. The diamond is a lovely cream colour, and has the most glittery microfaceted surface. I built a low bezel for the diamond, in order to maximize the beauty of its multiple faces. The diamonds I have available for this rings come in both cube and cluster formatioins. Each is conflict-free. The cubes that I currently have are black or cream. The clusters include white, pale silver, dark silver, warm orange, and cream. I also have two absolutely stunning raw pink diamond crystals- these stones are very rare and are at a premium, and will increase the cost of this ring set by $200-400. The wedding band sports a pair of small stones of your choice. 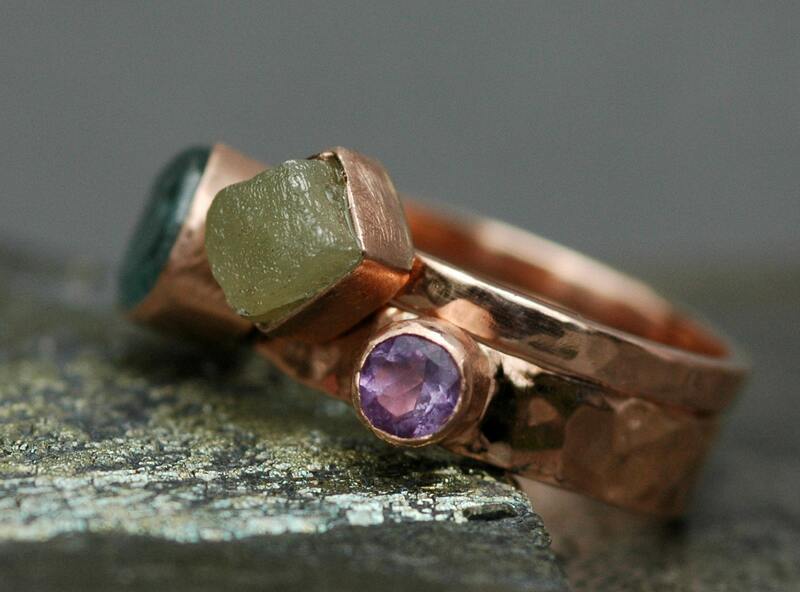 Here, I used a 4mm Rose de France faceted amethyst a raw zircon which I cut to form. The rings were carefully built in order to allow the diamond to nestle between the coloured stones. The rings can be turned around and worn with the stones pointing in either direction. 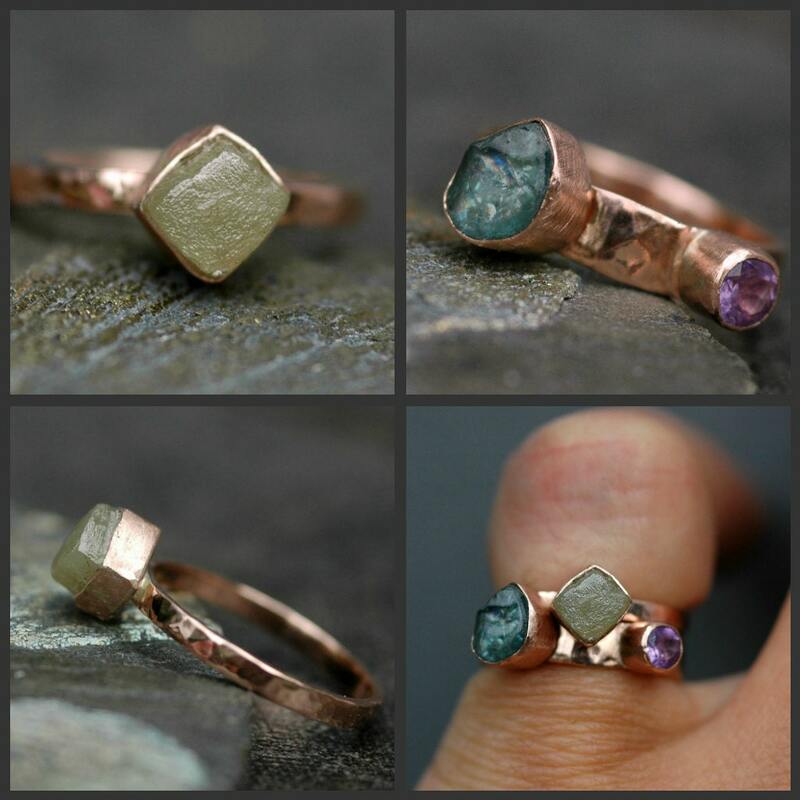 Most stones can be put into these rings for the same cost as you see in this listing. If you would like the stones in the wedding ring to be diamonds or higher-grade gemstones, this is possible for an additional fee. All of the bezels on these rings are built from 14k rose gold, and were given a hand-brushed finish. The edges of the bezels were cut with an engraver to create a bright line. 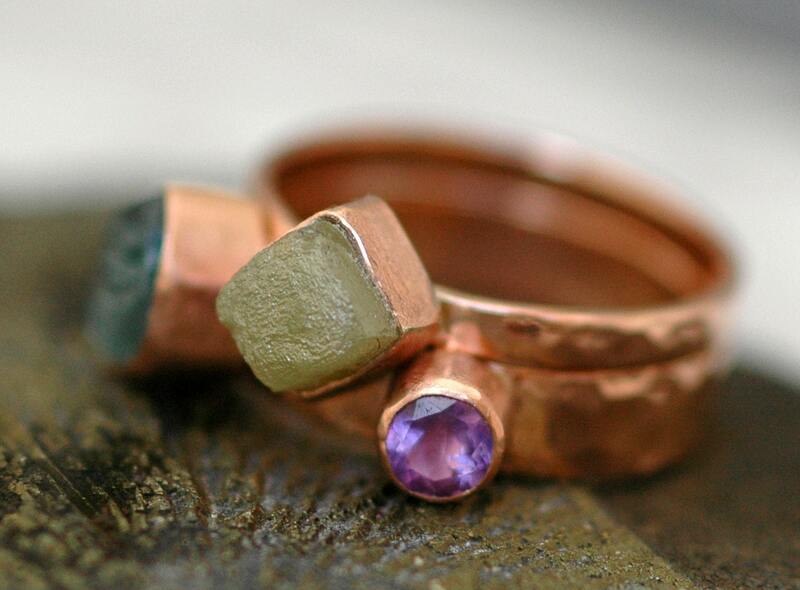 These rings can be built using a hammered finish, a matte lustre finish, a high-shine polish, or a hand-brushed finish. If you have seen another texture in my shop which intrigues you, it can probably be used on this set. As this is a custom, made-to-order set, please see my shop announcment for my current production time. This timeframe reflects the amount of time I need to build your rings after we have made decisions such as stone choices and ring sizes. SHIPPING- PLEASE READ: Is by the quickest method I can use to get your rings to you. This is two business day (to most locations, but some restrictions apply) in the USA, and approximately 3-5 business days outside of Canada and the USA. It includes a tracking number. Please note- this method carries only $100 in insurance. As the rings are moving with a reputable courier and must be signed for on your end, they are very well-protected. However, on the very rare and outside chance that they should become lost or damaged in the mail, I cannot cover the cost unless you have chosen to upgrade to full insurance. If you wish to do so, please get in touch for an estimate on this insurance.